The Trireme (triêrês) was an ancient battle ship primarily used by Mediterranean Empires including the Greeks, Persians, and Romans. This great technological advancement was first documented c. a. 535 BCE by Herodotus when he refers to a conflict between Samos and Egypt which states, “Polycrates selected those citizens who he suspected were most likely to revolt and sent them off in forty Triremes…” (Herodotus, III.44) Evolving from the Bireme, the Trireme quickly became the Greek Navy standard often replacing other ancient ships such as the much smaller Pentekonter which only consisted of 50 oarsmen contrasted to the Trireme’s approximate 170 oarsmen. These massive ships served a major role in the Greek’s ability to hold off the Persians in The Battle of Salamis. To understand that role better, let’s first consider its design. The basic architecture of the Trireme revolves around having three rows of rowers, as implied by the title, with one man per oar. The Engineers designed this warship with effective use of space in mind due to the large quantities of men required to operate it adequately. As such, the dimensions of the sheds were approximately 37 meters long, 6 meters wide, and 4 meters tall. This provided just enough space for oarsmen to operate effectively. The Trireme’s speed capability is approximated to have averaged around 5-8 knots (6-9 miles per hour) achieved by the use of sails, oars, and rudders to propel and direct its path. The oars were especially important in battle when great maneuverability and speed for ramming became vital, as the primary weapon utilized was a massive bronze ram heading the front of the ship near the surface of the water. The ram was the focus of Athenian Naval warfare because there was only little space for marines available, although they were carried in small quantities to defend the oarsmen who often could see very little. The ships were constructed of available woods depending on location usually including: fir, Cedar, oak, and pine. These materials may have differed slightly from case to case as different areas constructed Triremes slightly different, but the basic design always remained constant. With the primary material being wood, the crews were required to beach the ships at night to ensure that the ship would not become waterlogged. The Trireme usually included around 200 men to operate, 170 of them being oarsmen, with a small crew and a few marines. This, again, indicates the importance of maneuverability as the Trireme required large quantities of man power to ram and sink enemy ships. In The Battle of Salamis (c.a. 480 BCE), the Athenians utilized the Trireme and constricted waters to hold off The Persians. The Interesting thing about this battle is that The Persians and Greeks fought one another with similar technologies, the main material difference between the two was the volume of the fleets. 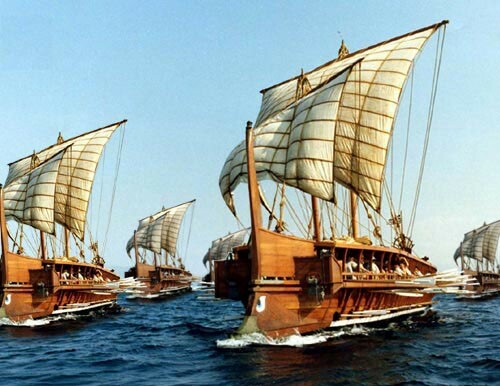 Herodotus recorded the Athenians to have gathered 371 Triremes (Herodotus VIII,46), while the number of Persian ships is disputed, it is approximated to have been around 1200 triremes. The Persians relied on the Greeks being overwhelmed by their massive fleet, however the Greeks utilized the narrow strait between the island and mainland to effectively hold off the incoming fleet as they rammed and attacked, with a beneficial advancing breeze on their side. By considering the Trireme’s remarkable design, The Persian’s inability to swim, and the geography of Salamis emphasizing Greek battle tactics, it is clear to see how the Greeks succeeded in effectively defending themselves in this great naval siege. “Battle of Salamis.” 5 February 2014. Wikipedia.org. Web. 6 February 2014. <http://en.wikipedia.org/wiki/Battle_of_Salamis&gt;. Greek Fleet of Galleys Based on Sources from The Perseus Project. 2008. Graphic. Wikipedia.org. Web. 6 Feb 2014. <http://en.wikipedia.org/wiki/File:Greek_Galleys.jpg&gt;. Herodotus. Herodotus: The Histories. Trans. Robin Waterfield. New York: Oxford University Press, 2008. Book. Lendering, Jona. “Naval Battle of Salamis (480BCE).” 17 July 2008. Livius.org. Web. 6 February 2014. <http://www.livius.org/saa-san/salamis/battle.html&gt;. Rankov, B. 2012. Trireme. The Encyclopedia of Ancient History. Taylor, M. C. 2012. Salamis, island and battle of. The Encyclopedia of Ancient History. “Trireme.” 4 February 2014. Wikipedia.org. Web. 6 February 2014. <http://en.wikipedia.org/wiki/Trireme&gt;. Wood, Adrian K. Warships of the Ancient World: 5000-500 BC. Colchester: Osprey Publishing, 2013. Book.